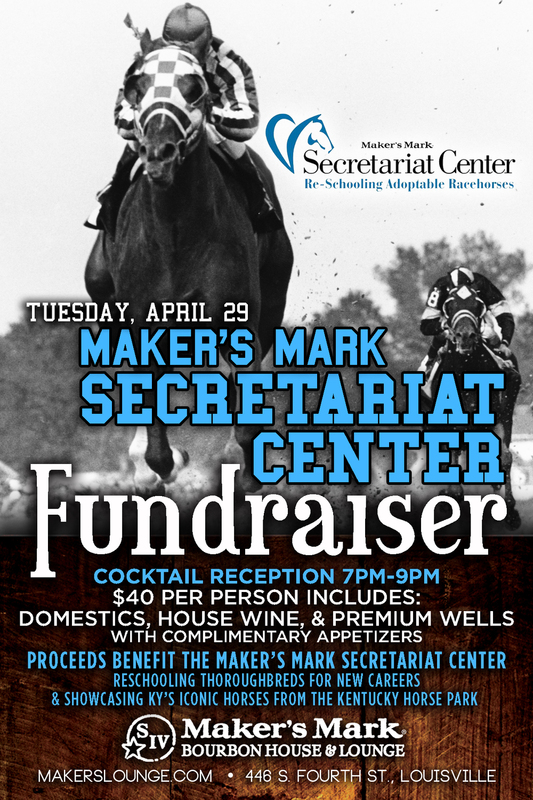 On April 29th 2014 the Maker’s Mark Bourbon House & Lounge in Louisville, Kentucky will be holding a fundraiser for the Maker’s Mark Secretariat Center to help raise awareness of our mission to reschool Thoroughbreds for new careers and showcase Kentucky’s iconic horses from our location at the Kentucky Horse Park. This cocktail reception will take place from 7pm to 9pm and will include appetizers, domestic beer, premium wells, and house wine by the glass, all for a $40 ticket, a portion of which will go to benefit the MMSC and the horses we help on a daily basis. In addition, the event will feature a drawing for a $500 table for Kentucky Derby night for 5 guests, including an appetizer platter and bottle service. Tickets can be purchased by clicking the following link: http://buyblitztickets.com/piUeu. It is sure to be an enjoyable evening, so please plan on swinging by for cocktails if you’re in the Louisville area!